“You can't go to Varanasi as your first stop in India; you have to work up to it.” My Indian traveling partner, Jatender, said as we boarded Jet Airway’s comfortable flight from Delhi. He wasn’t kidding. One of the principle cities of the North Indian state of Uttar Pradesh with over 3.6 million people, Varanasi -- also called Benares -- looks much like any other large urban area in India. It’s chaotic and crowded, with a high disparity of those who have and have not. But you quickly sense something different about this former home to Lord Shiva, considered by Hindus to be the oldest city in the world. There’s an energy – electric in the air – that seems to set its inhabitants on a common rhythm. At the bookends of every day that rhythm quickens and draws them together. And what drives that rhythm? Ganga. One of the many ghats along the banks of the Ganges. The River Ganges is the lifeblood of all things in this holiest city in India. Along her muddy shores can be seen the entire spectrum of human existence, from birth to death and everything in between. She is worshipped as the goddess Ganga, the most sacred river to Hindus who center their lives around her and make pilgrimages from afar to her shores. A dip in her waters is believed to wash away all sin, and most Hindus dream of standing in her tide at least one time in their lives. She has also been ranked among the top five most polluted rivers of the world; with contaminants more than a hundred times higher than official Indian limits. Yet all along her banks Hindus bathe in her waters. They pay homage to their ancestors and gods, offering flowers and rose petals and shallow bowls of burning ghee to her current. Often they will leave Ganga with small quantities of her water to keep her in their daily lives. The contrasts of life along the Ganges is dizzying. At the more than sixty ghats in Varanasi people convene daily to pray, chant and perform ablutions in her brown water. They stand chest deep and cup water in their hands, lifting it and letting it fall. They dip their heads below her surface to cleanse their souls. A few meters over, men wash laundry, spread-eagled in knee deep water, swinging and slapping fabrics on rocks to get them clean, then stretching them on the hard banks to dry. Just beyond, children swim, jumping from abandoned concrete abutments to shrill laughter and cheers. A dream of many Hindus is to die on the banks of Ganga - the path to Nirvana. Along the bank at Hanuman Ghat – one of the several cremation ghats – log pyres as tall as three meters burn, their flames dancing toward the sky through thick, acrid smoke. Further upstream a frail, sick man lies alone at the edge of the water, waiting to die. There is no place more longed for by Hindus at their time of death than the Ganges’ banks in Varanasi; the Shmashana, or great cremation ground. Their ashes – and even entire intact bodies wrapped in muslin – are released to Mother Ganga’s natural ebb and flow on their posthumous path to Nirvana, bypassing further reincarnation to instant salvation – the fast pass to Moksha. It’s so important that worshipers from elsewhere in India often transport the bodies of loved ones to Varanasi (often on the roof of a car) to send them off in the Ganges. It was a blistering afternoon when Jatender and I visited Sarnath just outside of town, the most famous of the many temples here and the spot where thousands of years ago Lord Buddah delivered his first sermon extolling the virtues of Buddishm. From there we maneuvered through crippling traffic along narrow, dusty streets jammed with cars, scooters, ox-drawn wagons, diesel-belching busses and throngs of people on bicycle and foot. Our goal was to experience the Aarti Ceremony, a daily Hindu ritual to pray to deities during the setting sun. Jatender tried to prepare me for what was to come; to steel me for the onslaught of religious fervor the likes of which I had never before experienced. It was a futile effort. At Dasaswamdh Ghat we join throngs of pilgrims for prayer at Ganga’s edge. The solemnity is electrifying, a spiritual current in the air linked to a river which leads closer to Nirvana than anywhere else in the Hindu world. Ganga’s surface is nearly obscured by countless boats bumping against each other under the tenuous list of overcapacity. Hundreds of diyas float by between vessels everywhere, their leaf bowls filled with burning ghee glowing yellow in the darkening drift. We’re squeezed on the ghat steps among thousands of believers chanting and praying to the lead of men on platforms at the edge of the water. As darkness descends the air is thick with the malodor of humanity at its lowest common denominator, pious pilgrims from across India crowding together in the evening heat. The drone of chanting mantras, thumping drums and jingling bells is continuous until the cacophony melds into one indiscernible din of sound which resonates deep within my body and leaves me lightheaded. Afterwards we are swept along with the sea of spiritually-sated followers to nearby galis – narrow streets and alleys – to satisfy more earthly cravings: for food. We are pushed along by the masses, dragging ourselves out whenever we see something that looks tasty or strange. The choices are many; makeshift storefronts with men sitting cross-legged on tables cooking food amid an endless clot of hungry people clamoring for attention. We want to try as many Benarasi flavors as possible, including tasting the fragrant 'Benarasi paan' that often contains aromatics of rose and 'supari' (areca-nut). Chewing this 'paan,' then spitting seems to be a part of the cultural identity of the people of Varanasi. In Vishwanath Gali we find tiny, unnamed joints selling aloo-palak pakoras with hot and sweet chutneys, and thandai. 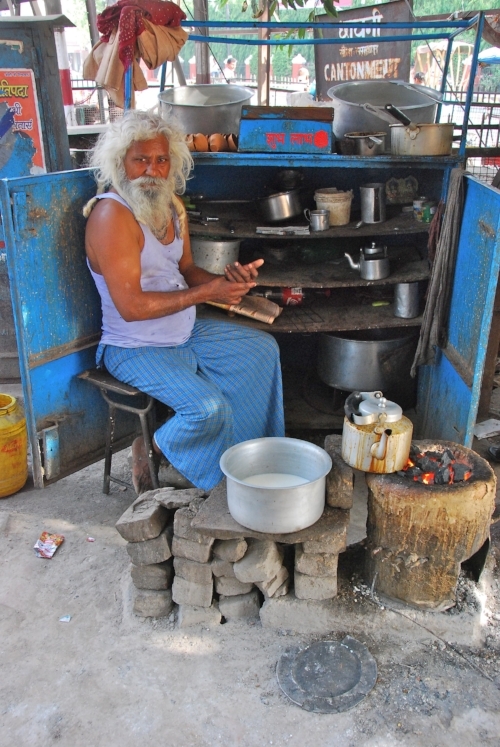 The shops are so small and narrow that no one can enter past the cook sitting beside his hot griddle and glowing coals. 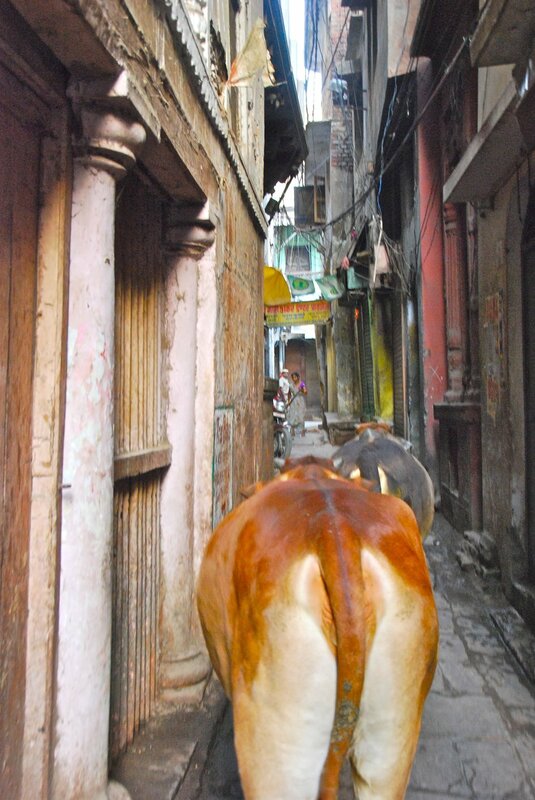 We stand and eat in the narrow alley as pilgrims and the occasional free-roaming cow brush blindly past us. Along the streets we bark orders in unison with the crowd at vendors, elevated on their cooking platforms, for servings of potato tiki, spicy fried tomatoes, sautéed spinach leaves and numerous variations of kachori. In one place we invade a table cramped with a group of women who have pilgrimaged from Southern India. Despite our language limitations we share a vast selections of pani-puri – small crisp balls, hollow and filled with a scoop of greenish mint water from a bucket or stuffed with mashed vegetables then doused in thick yogurt and sour tamarind. At a windowfront with a freezer a man is selling kulfi falooda, an unchurned, eggless ice cream, topped with thin cellophane noodles of rose syrup and saffron, slippery and blazing yellow. Its texture is delicate and creamy, with a floroal, milky flavor. Banarasis have a passion for milk or yogurt-based drinks, surprising given the lack of refrigeration on the street. Lassis are also common, served from flat bowls sitting on open counters in the 42 degree Celsius heat. The texture is a bit unsettling at first – thick, creamy and slightly sour. We drink them from little clay kulhads then shatter the fragile cups on the ground by the shop. Another specialty drink is thandai, made of water, sugar, watermelon, muskmellon, lotus seeds, almonds, cashew, cardamom, rose-flower, white pepper and saffron. We let the mixer add bhang to the thandai -- a leaf much like marijuana or opium that grows wild throughout the region -- to give it a pleasant, intoxicating kick. Late into the night we gorge on paapri-chaat garnished with coriander, ghee, yoghurt and sugar syrup; spinach and gram flour pakora fritters; potato and pea samosas with chutney; and many other forms of chaat doused with the sweet and sour tang of ginger and tamarind chutneys and air-warmed yoghurts. We wash it all down with chai and rosewater and sweet/sour masala-flavoured kanji, thick like chowder. And then there are the sweets – Banarasis do like their deserts. We eat hot, crispy jelebis, day-glow orange and dripping syrup and so many other delights; honey-soaked bowls of sweet condensed barfi; rabri like dense cheesecake; coconut and pistachio chumchum made from homemade cheese; and chickpea and semolina laddus, like sweet round balls of dough. The list goes on and by the end of the night I am full beyond comfort and concerned with the possibility of digestive repercussions from such exotic, unfiltered eating. But thankfully they never appear. When the sun is high in the sky we leave the water’s edge in search of food. Outside the Golden Temple, deep within a maze of tiny alleys and walkways, we drink hot chai and eat deep fried katchori, a round flattened dough ball stuffed with a mixture of potato, dal, gram flour and spices. Sold in leaf bowls, they are usually accompanied by a dry, spiced chickpea ghugni or with a spicy potato curry. A dousing of tamarind sauce adds a bittersweet finish to the bite-sized breakfast. From there we work our way out of the maze – no easy task – and return to our hotel -- if that’s what one can really call the Taj. The Taj Nadesar Palace is a mind-spinning contrast to the street level existence along the banks of the Ganges. A10 guest room resort owned by Maharaja Prabhu Narain Singh of Benares to host heads of state and dignitaries and now managed by the exclusive Taj Hotels & Resorts, it is truly a maharajah’s palace. The stately building is both intimate and grand; true luxury, old-school style. My room, with enormous pedestal bed, sumptuous furnishings, rich textiles and marble everything, gives an insider’s understanding of the upper echelon of Indian culture. After settling in as if I owned the place (which is how every guest is made to feel), I am led by horse-drawn carriage around the property and through the organic gardens by sous-chef Sumalya Sarkar before entering the kitchen to see the action and later sample the delectable food – so foreign from that on the streets. It is the best that an accommodation in an important place like Varanasi can offer. To represent Taj’s commitment to local food and flavors and the thousands of years of culture behind it, Executive Chef Sanjeev Chopra serves me his specialty Satvik Thali – a selection of carefully prepared vegetarian recipes designed to establish calmness, purity and balance. The food was elegant and refined yet true to its local origin; each dish bursting with contrasting flavors of eggplant, dal, ochra and curry. Small, flavorful side items accented specific dishes, one cooling the heat, another lightening the heavy, each adding texture and balance. And with every bite came a sense of authenticity, a taste of India in its genteel, refined state – pure, local food dressed up for nobility and honor and prepared as well as food can be made. It was a feast that rounded out my culinary odyssey of Varanasi – from lowest-to-the-ground eating in the narrow galis along the Ganges, to the highest of Benearasi haute cuisine in a palace constructed for kings. It is difficult to sum up Varanasi except to say it’s exotic and overwhelming to all senses. A dazzling montage of reality; some things that you can’t stop marveling at; others you wish you hadn’t seen. It’s a land of contradiction: of rich and poor; beauty and revulsion; miracle and tragedy – all inexplicably bound by a cultural cord dating back thousands of years. Mother Ganga is a living, moving, humanity-consuming goddess whose holy stature vastly exceeds the width of her banks or the depth of her waters. The spiritual fervor around Varanasi’s narrow streets and at Ganga’s filthy yet sacred shores is electrifying and confusing – and as a visitor it’s easy to encounter an internal battle between loving it and hating it. But it matters not which of those feelings win out, but simply that it makes you feel. And whatever mix of emotions you leave with there is one word all who go there will use to describe this place: Incredible. Jet Airways makes getting from Singapore to India quick and easy. In Delhi, you’ll easily connect to Jet’s quick flight to Varanasi. And because it’s India’s largest internal airline – going virtually everywhere in the subcontinent – you can check your bags all the way through. As an air-weary traveler I was pleasantly surprised by Jet’s excellent service, great entertainment and – believe it or not – exceptional food. For details see www.jetairways.com Of course, to get the most out of your India experience you should rely on the experts. Luxe India, with their unique Le Concierge services, is the most respected high-end tour outfitter in India and will make all arrangements for an experience of a lifetime. For details go to www.luxeindia.in. And for a memorable stay at the Taj Nedesar Palace, see www.tajhotels.com.